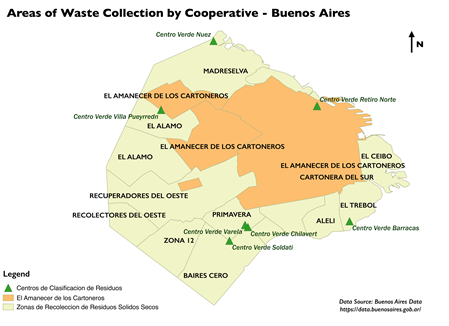 Buenos Aires (in)formal waste pickers’ cooperatives: a new governance model for waste management? Urbanization, economic development and exponential demographic growth have maximized urban services problems in many cities around the world. Just like in the case of water and sanitation systems, providing waste management services to millions of people requires complex institutional and technical arrangements. Compared to other utilities however, waste stands out for its multifaceted characteristics and its fluctuating nature. Indeed, while waste is commonly considered as « garbage » – i.e. something no one wants and that cannot generate any benefits –, it can also become a resource, acquiring commodity features since its management and recovery generate profits. Such is the bipolar nature of waste that Jeremy Cavé highlights in his studies (Cavé, 2015). Considering waste a resource allows us to understand the reason why so many conflicts arise when it comes to its appropriation. Many stakeholders are in fact involved in its collection, processing and disposal, competing to extract value from it. For instance, in countries like India, Egypt, Morocco, Senegal, Brazil, Argentina and Colombia, poor urban populations often revert to informal waste picking as a survival strategy in order to extract value from recycling materials found in the streets. Far from only being a survival strategy, informal waste picking has in many cases become an occupation carried on from generation to generation by entire families. The high number of informal waste pickers in cities like Cairo, Mexico City, São Paulo, Bogota, and Buenos Aires has increasingly spurred the debate on the legitimacy of this informal practice, highlighting the need to start implementing or re-thinking recycling waste management systems. Indeed, in the past 20 years, more and more municipalities around the world have adopted recycling schemes in order to manage the entirety of the solid waste stream, not only its unrecyclable component. The so called ‘modernization’ processes of Solid Waste Management systems (SWM) often follow the necessity to cope with dumping sites congestion and to implement environmentally sustainable policies. However, modernization schemes generate disputes over the appropriation of waste among the many actors involved in extracting its value. Informal waste pickers often become victims of new public policies on waste management that prohibit their activity, and either centralize collection and disposal services, or delegate them to private companies. Appropriation conflicts arise among private companies, municipalities, and informal workers due to the very nature of waste as a good. Neither fully public nor private, garbage is an object that by definition is rejected and abandoned, therefore intrinsically carrying undefined property rights. Moreover, its value fluctuates, as from being an abandoned object it can be recovered and acquire value due to this re-appropriation. Analyzing the governance of solid waste in Coimbatore, India and Vitória, Brazil, Jérémie Cavé thus calls for the need to abandon the dichotomous approach that treats waste as either garbage or resource, and start considering solid waste as a common good. Being a rival and non-excludable good, waste requires a governance model that goes beyond the public/private dichotomy. To overcome the classic governance solutions that either opt for a centralized municipal system or a delegated private service, we hereby analyze a third option, which allows us to truly apprehend waste as a common good. The case of Buenos Aires, Argentina, shows the possibility of forging public- civil society agreements, enforcing a system of waste management based on cooperatives rather than private companies or public entities alone. In the words of Sheila Foster, “a third option for managing common resources is a regime in which a community self-manages or assumes a greater role in governing those resources in a sustainable way” (Foster, 2009: 280). The research I conducted in Buenos Aires, from January to May 2018, stresses the political potential of informal actors organizing when it comes to the governance of urban waste services. Through the analysis of Buenos Aires informal waste pickers’ political organization, my study re-centers social sciences’ focus on the informal sector, a socio-economic stratum that is often overlooked or underestimated due to its marginality. Especially when it comes to waste picking however, this sector is all but marginal. An estimated 20 million people around the world work in the waste recycling sector (ILO, 2013). UN Habitat data highlights that between 15% and 35% of the world’s waste is recovered by these informal workers (2010). In Argentina, far from being a “new social actor”, informal waste pickers have accompanied the urban development of the city of Buenos Aires since the 19th century (Schamber and Suarez, 2007). It is however due to the economic crisis that hit the Argentinian economy at the turn of the century that their presence in the city’s streets has heavily increased. As of 2006, informality made up 39% of total employment in Argentinian urban areas, an increase that started in the 1980s, reaching its peak during the crisis years (World Bank, 2008). From repressing informal waste collection as an illegal activity, the City government has reacted over the years to a waste crisis that led to a radical transformation of Buenos Aires waste management system. Between 2002 and 2013 the city was the theatre of continuous mobilizations and negotiations between cartoneros (1), non-governmental actors, and public authorities. A conflict that started as a ‘usage rights’ dispute over waste (2) (Cavé, 2015) developed into a profoundly political struggle that epitomizes the conflictual nature of waste management politics and symbolizes the transformation of labor-state relations in the past 30 years. Previously excluded from any negotiation with the State, informal workers have indeed succeeded in being recognized as a legitimate actor by the local government. Thanks the progressive formalization of their labor by the City government, a majority of cartoneros have entered and created recycling cooperatives, acquiring sale power, rights and regulations, which have improved their working conditions and quality of life. Today, more than 5300 recuperadores urbanos (urban collectors) officially manage the collection of recycling materials in the city of Buenos Aires. The City has contracted 12 cooperatives, which collect around 600 tons of waste per day out of the 6000 tons of waste produced in the city. This regularization or ‘formalization’ did not unfold as a peaceful process of policy change. Filled with political conflict, the process of legitimation of informal waste picking lasted more than 10 years, and it is still ongoing. Notwithstanding the contracting of the 12 waste picking cooperatives in 2013, the fieldwork I conducted for this research highlights the controversial nature of the formalization instruments implemented by the City. Our findings question whether the City actually formalized Buenos Aires waste pickers in a substantial way. If we define formalization as legalization, the City has indeed succeeded in formalizing a practice that was before illegal and persecuted. However, if formalization means acquiring full formal labor rights like the ones granted to any other formal occupation, our research finds that Buenos Aires waste pickers cannot be considered fully formalized yet. Cooperatives as a successful governance tool? 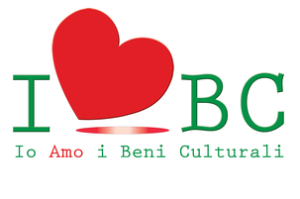 At the center of this controversy lies the figure of the cooperative as the instrument chosen by both waste pickers and the City in order to formalize the activity. Our interviews show that cooperatives represented an accessible organizational structure for waste pickers, who came from a complete individualistic organization of labor, and who didn’t have enough resources to fund an enterprise. The organization of labor with rules and regulations introduced through cooperatives has allowed waste pickers to recognize themselves and be recognized by society as legitimate workers. The formalization of their status therefore led to a process of consciousness building that in turn stimulated an organized movement of political mobilization. Since 2001, waste pickers have progressively politicized their workers identity, demanding the full recognition of their labor rights to the City. Such politicization has further prompted major waste pickers organizations to extend their mission, and mobilize for the recognition of other informal occupations like street vending and seam stressing, among others. However, if on the one hand formalization engendered this process of collective identity activation and sector-wide organization, on the other hand it also relegated waste pickers to an ambiguous worker status. The cooperative system adopted by the City indeed allowed authorities to delegate a public service to a third party, without having to pay for it as much as for a private subsidiary company, and without having to respond to the obligations deriving from a traditional labor contract (Parizeau, 2015). Thus, the system set up in 2013 contracted cooperatives to manage recycling waste in exchange of a monthly incentive or subsidy granted by the City, well below minimum wage standards, and further excluding waste pickers from traditional models of labor negotiations. Waste pickers are therefore de jure self-employed – they are granted social security as such – , but they are de facto dependent on the City’s monthly incentives and logistical support (machinery, equipment, uniforms). If the membership in cooperatives granted welfare rights and fostered a process of identity building, it also positioned them in an ambiguous situation, in-between being formalized but not yet becoming formal workers. The findings that this article has tried to briefly illustrate reflect the realization that urban actors such as waste collectors represent at once the transformations of the labor market, and the challenges at stake in the coordination of service provision in large metropolis. Moreover, they highlight the particular nature of waste as a common good, which calls for innovative governance tools able to distribute usage rights to different stakeholders. In this sense, cooperatives constitute an interesting organizational tool, capable of channeling citizens and associations’ collective action efforts in order to more equally dispose of a resource. Therefore, the study on cartoneros’ mobilization not only sheds light on new patterns of political organization among informal actors but it also indirectly informs us on how to improve workers conditions, services, and governance structures in large urban agglomerations. Finally, Buenos Aires waste pickers’ formalization allows us to introduce a new perspective in a field like waste management studies that is often dominated by environmental and overtly technical approaches. Bringing politics back into the study of infrastructures and urban services means deconstructing the apparent technical decisions of urban governments and underlining their socio-political implications (Lorrain, 2014; McFarlane Rutherford, 2008; Le Gales and Lorrain, 2003). Analyzing utilities networks constitutes a “gateway to the issue of governing large cities” (Lorrain, 2014), as their construction and management requires an out of the ordinary institutional coordination effort. If utilities represent a key governance tool in the large metropolis, it is important to analyze the policy instruments and regulations that control their organization (Lascoumes and Le Galès, 2007). Formalization processes and the instruments that are chosen to implement them, therefore acquire a political significance as they often reproduce “existing set of power relations within urban societies” (McFarlane and Rutherford, 2008: 365). The waste management sector is especially prone to such political dynamics due to its enormous incidence on local governments’ budgets, and to the diverse array of stakeholders that often pursue opposing interests. It is estimated that an effective waste management system makes up 20 to 50% of municipal budgets (World Bank, 2012). Considering that urban residents’ per capita waste generation will increase from 1.3 billion tons per year in 2012 to 2.2 billion tons in 2025, waste management will continue to constitute a serious challenge for urban governance worldwide (World Bank, 2012). Cartoneros is the Spanish term used in Argentina to refer to informal waste pickers especially in the post-crisis years. It first carried a negative undertone. It has progressively been re- appropriated by the very waste pickers. Jeremy Cavé refers to usage rights as granting “privileged access to a flow of resource units” (p.174). When we talk about usage rights disputes in the case of Buenos Aires we therefore highlight the appropriation conflicts that arise among different urban actors who seek to access a resource – i.e. waste – and eventually obtain the right to access waste and dispose of it. Private companies and informal waste pickers were notably taking part in this appropriation conflict in Buenos Aires, both trying to extract value from waste. This article is an adapted and (very) summarized version of my Master’s thesis: MALANDRINO, Cosima. 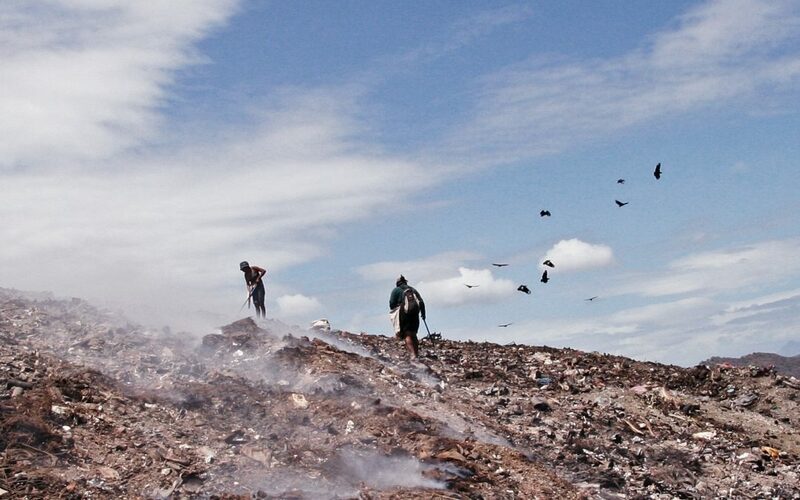 (In)formal Workers Organizing: The Politics of Buenos Aires Waste Pickers . Master’s Thesis: Political Sociology. Institut d’Études Politiques de Paris – École Urbaine , 2018. English, pp. 104. FOSTER, Sheila R. “Urban Informality as a Commons Dilemma”. The University of Miami Inter-American Law Review, Vol. 40, No. 2 (Winter, 2009), pp. 261-284. LASCOUMES, Pierre, and Patrick LE GALES.  Introduction: Understanding public policy through its instruments – From the nature of instruments to the sociology of public policy instrumentation, 2007, Governance, Vol. 20, No. 1, pp. 1-21. LE GALES, Patrick, LORRAIN, Revue française d’administration publique. 2003/3 (n 107), pp 305-317. LORRAIN, Dominique. Governing megacities in Emerging Countries. New York: Routledge, 2014. McFARLANE, Colin, and Jonathan Rutherford. “Political Infrastructures: Governing and Experiencing the Fabric of the City.” 2008. International Journal Of Urban & Regional Research 32, no. 2: 363-374. PARIZEAU. Kate. 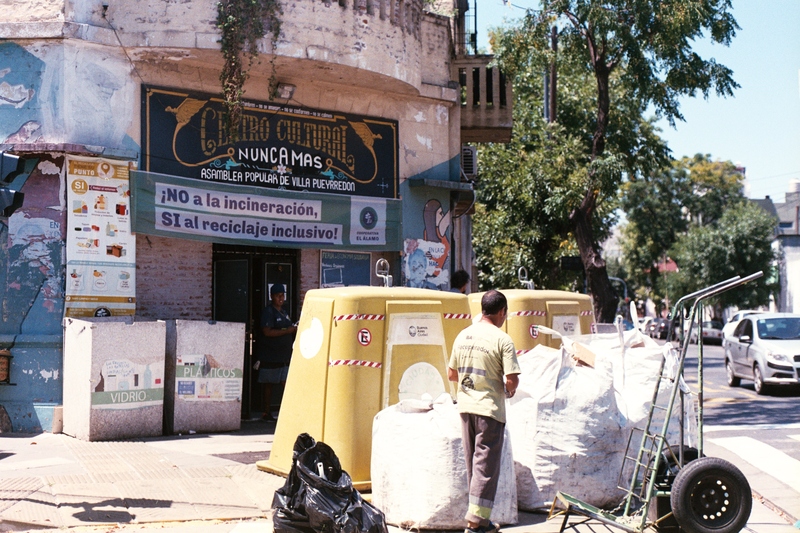 Re-representing the city: waste and public space in Buenos Aires, Argentina in the late 2000s. Environment and Planning. 2015, Vol. 47, Issue 2, pp. 284 – 299. SCHAMBER, Pablo, SUÁREZ, Francisco M. (eds). Recicloscopio: Miradas sobre recuperadores urbanos. Buenos Aires: Prometeo, Universidad Nacional de Lanús, 2007 pp. 324. BERTRANOU, Fabio, CASANOVA, Luis. Informalidad laboral en Argentina: Segmentos críticos y políticas para la formalización. Buenos Aires: ILO para Argentina, 2013. 155 pp. CORAGGIO, José Luis. La presencia de la economía social y solidaria y su institucionalización en América Latina. 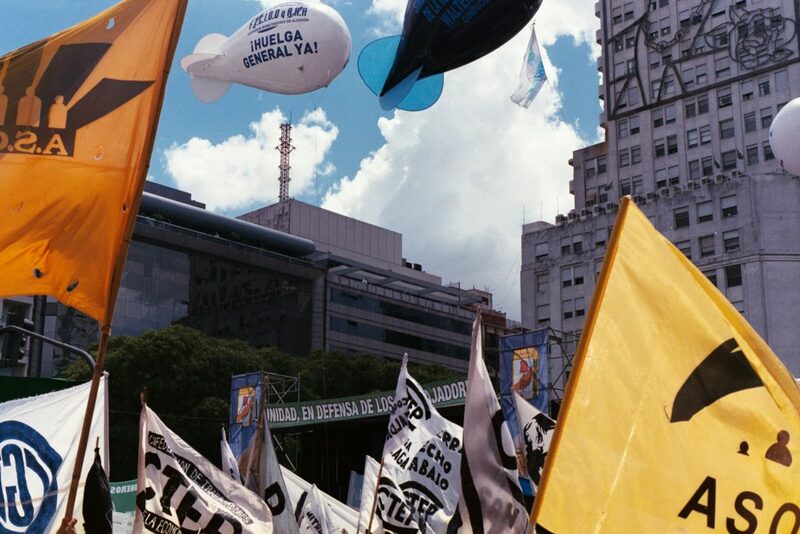 UNRISD Occasional Paper: Potential and Limits of Social and Solidarity Economy, 2014. No. 7, United Nations Research Institute for Social Development (UNRISD), Geneva. WORLD BANK. Labor Market Study Informal Employment in Argentina: Causes and Consequences. March 27, 2008. Report No. 36092-AR. WORLD BANK. What a Waste: A Global Review of Solid Waste Management. Urban Development Series, 2012. The deadline to submit an abstract has passed, but you can register to attend the conference here.